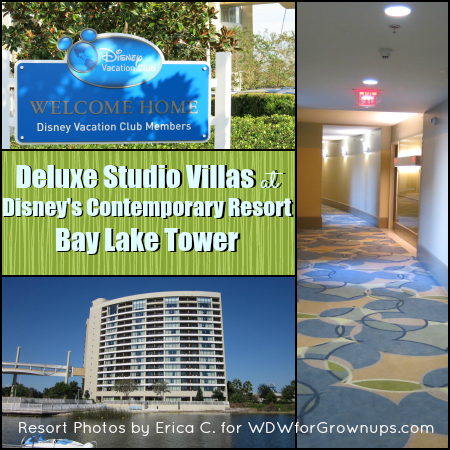 Bay Lake Tower (BLT) at Disney's Contemporary Resort is a Disney Vacation Club Resort with Deluxe Villa Accommodations. No matter how many guests are in your party, there is a villa at BLT that will suit your needs - from a studio that can sleep four, up to a three bedroom grand villa that sleeps twelve! 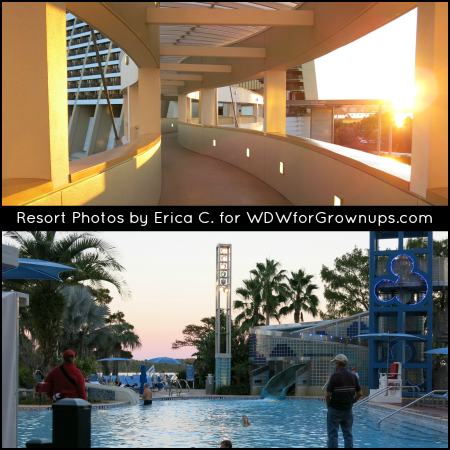 There are also three views to choose from including a Standard view (courtyard, parking lot), Lake view (Bay Lake) and Theme Park view (Magic Kingdom). On a recent trip, we stayed in a Deluxe Studio with a Lake View. 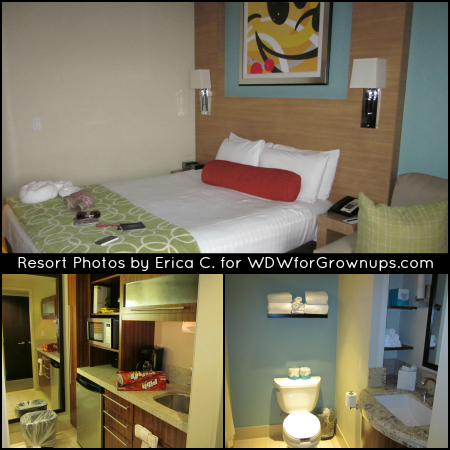 The room was a nice size complete with queen size bed, pull out sofa, and a nice kitchenette area perfect for two. The kitchenette included a bar fridge, microwave, toaster, coffee maker, sink, and quite a bit of storage for any snacks or groceries. The bathroom was modern but was lacking counter space. Unlike many resort rooms that have the vanity area separate, it was in the bathroom. The private balcony was also a decent size and had two chairs and a small table. 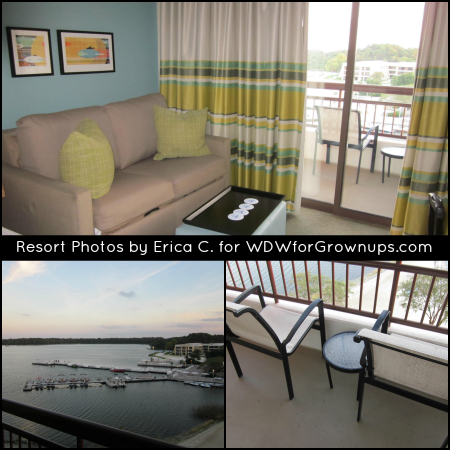 Our particular view was overlooking the side of Bay Lake towards the marina and boat launch. It made for some relaxing afternoons and evenings sitting there watching the boats come and go. We could also see the Electrical Water Pageant at night however, we found the view from the beach to have a slightly better view. There are no restaurants in the Bay Lake Tower building, however there are four just next door at the Contemporary. Just walk over via the skyway located on the fifth floor of BLT and it leads you right to a couple great dining experiences. There are many good options including Contempo Cafe (counter service), California Grill (signature dining), The Wave (table service) and the very popular Character buffet Chef Mickey's. However, for a special treat reserved just for Disney Vacation Club Members and their guests, the Top of The World Lounge is located on the very top floor of Bay Lake Tower. This contemporary lounge provides snacks, drinks and even a great view of Wishes fireworks with music piped in from the Park. Overall, we loved our stay in a Studio Villa at BLT. The view of Bay Lake was nice and you really can't beat having a walkway right to the Magic Kingdom! Have you ever stayed at Bay Lake Tower? Leave a message below and share your favorite memory of the Resort with us! Thanks so much to Guest Author Erica C., also known as Spook in our member forums. Erica lives in Ontario, Canada, loves everything Disney, and visits Walt Disney World every year. She and Husband Erik became Disney Vacation Club members in 2014! No, but I wish I could. I'm trying to plan a quick week long trip on a very tight budget. I was hoping to buy someone's points. I can't remember the website but I think the man's name is Dave? Know what I'm talking about?